Just when most of us had almost forgotten about Google+’s existence, the search giant is now prepping to release a “brand new” version of the app on Android. First reported by Android Police, this development was confirmed by Google+ engineering manager Leo Deegan on Google+ itself (not meta, but a way to show that the platform is still kicking!?). There is no confirmed timeline for the upcoming release, instead it’s been asserted that you’ll be able to notice various new changes ‘over the next several days’. As per Deegan’s official post, the new Google+ app will still closely resemble the existing Android app with numerous under-the-hood modifications. The team has completely re-written quite a major chunk of the app, tweaking how several of the core features of the platform work. The new Google+ app is no longer dependent on the original infrastructure but has been built upon a more modern stack. This will enable them to test, as well as integrate newer features into the Android app more rapidly. And the tweaks are already incoming with an upcoming update. 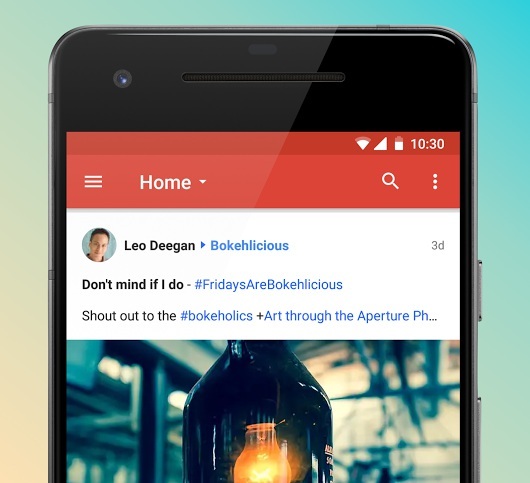 In the process of rewriting the app, the Google+ team was able to make a few substantial reforms. The new app will smoother to use for the community, thanks to a much-improved stream rendering and scrolling mechanism. The photo lightbox, as well as comment options, have also bagged a revamp, along with better spam prevention features baked into the app. It is, however, possible that you may encounter a bug or two because the app is still under testing. While there’s no concrete way of telling you how the new app will function without giving it a swirl ourselves, it’s just to say that Google is still spending a lot of time to make Google+ a better community-gathering platform on the Internet. All of Google’s services that were once tied down to this central social profile were severed a long time ago, leaving it to the mercy of the few remaining loyal members. Now, it may not be possible for Google+ to reach close to the likes of Facebook, Instagram or Twitter, but it could still hold its own ground for loyal members. Do you still use Google+ on the regular? If so, let us know your thoughts in the comments down below.